Pep Guardiola, who seemingly struggles against Liverpool, has suffered yet another blow, with the Reds ascertaining authority in the second leg too. The match ended 2-1 in the favour of the travelling side, despite the hosts’ exhibition of a flawless start to the widely anticipated fixture. Gabriel Jesus stunned the supporters by netting in an early strike, displaying the potential of a second leg comeback. 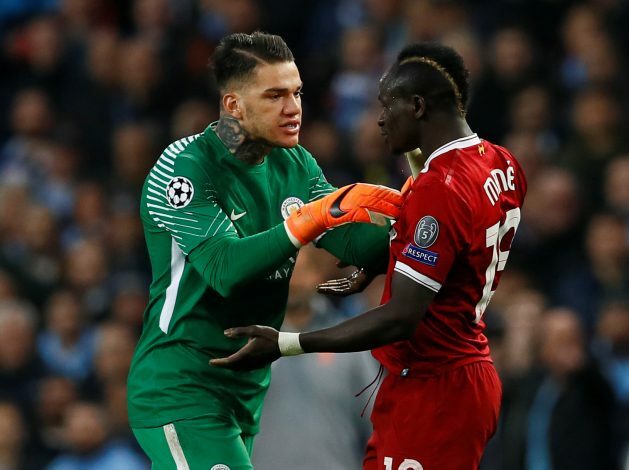 The match evidently recorded plenty of tackles, however, Mane’s ruthless one on Nicolas Otamendi was intensely reacted to by the City shot-stopper, Ederson. The earlier fixture in the Premier League had seen the Liverpool forward getting sent off because of a reckless challenge, which further resulted in Ederson’s face requiring stitches. This time, the Senegal international left Otamendi in agony. The Mancunian goalkeeper lost his cool accordingly, and confronted the tackler, pushing the forward multiple times. Fortunate for either side, Mane kept the composure, and Ederson got away with just a booking. The defeat has ensured that the Sky Blues won’t progress any further in the Champions League this year, disregarding their overwhelming display of football in the Premier League. The Spanish gaffer can’t seem to replicate the initial flair his team produced, evident from the previous results. Nevertheless, the Etihad outfit sits comfortably on top of the league table, quite indisputable that they would go on and enjoy placing the silverware in their mantlepiece this year.